Although he was known as a mystery/thriller and travel writer, David Dodge began his writing career as a playwright. 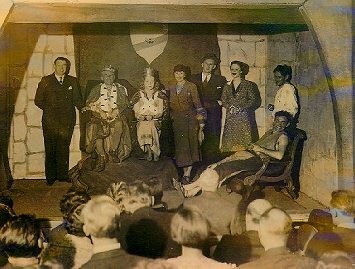 In 1934, David and his older sister, Kathryn, begame members of the the Macondray Lane Players, a group of amateur playwrights, producers, and actors whose goal was to create a theater purely for pleasure. The group was founded by George Henry Burkhardt (who later became Dodges brother-in-law when Kathryn married him in 1937) and performed exclusively at Macondria, located in the basement of Burkhardts house at 56 Macondray Lane on San Franciscos Russian Hill. Dodges first Macondria play, Proganda Preferred, was performed in March 1934 as one of four one-act plays on the theme of War (he had acting roles in the other three). Another Dodge-penned play, A Certain Man Had Two Sons, became his first published work when it took first prize in the Northern California Drama Associations Third Annual One Act Play Tournament. The prize-winning play was subsequently published by the Banner Play Bureau, of San Francisco, in 1936. Two other Macondria-produced plays won similar honors: George Burkhardt took first prize in 1935 with Oriental Fragrance and Frances Montgomerys The Last Buffalo won second prize in 1937. Courtesy of The Bancroft Library. Macondria was home to 120 world premieres of original plays in its ten years of existence (a fire razed the Burkhardt house in 1938, thus terminating its existence in the spectacular fashion which illuminates the history of San Franciscos theatres on the Gold Coast during the 1850s (Harrison, p. 284)). Except for two early offerings, all of the plays performed in Macondray Lane were written by members of the cast and their friends, relatives, and acquaintances. Performances were free, although you had to know someone involved with the theater (or know someone who knew someone ... ) in order to gain admittance. The theater sat fifty, give or take a few who had to watch the show from the stairs, and performances were nearly always sold out, even if there was no box office. In addition to Burkhardt and Dodge, other regular company members included Morris Shaw, Kathryn Dodge Burkhardt, Frances Montgomery, Steve Broder, Harvey and Edith Muldoon, Whitney Henry, Enola Barker, Lettie Connell (Kathryn Dodge Burkhardts daughter), and Elva Keith (Dodges wife—they married in 1936). Cast (left to right): Morris Shaw, Kathryn Dodge, Alma Eldridge, David Dodge, Frances Burge, Frances Montgomery, Blanche Tolmie. 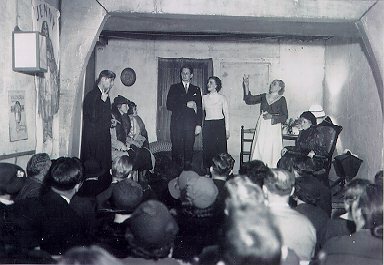 Another Dodge play, Christmas Eve at the Mermaid, co-written by Loyall McLaren (his boss at McLaren Goode & Co.), was performed as the Bohemian Clubs Christmas play of 1940, and again in 1959. In 1961 the Grabhorn Press published the play in a volume entitled Shakespeare in Bohemia. Harrison, Alan. Little Theatres. San Francisco: Works Progress Administration, 1940 (San Francisco Theatre Research ; vol. 12). Herron, Don. The Literary World of San Francisco & its Environs. San Francisco: City Lights Books, 1985. Schubert, Lettie Connell. Letter to Kendal Dodge Butler, 1998. Schubert, Lettie Connell. Personal communication, 2003.